Welcome to ravonstreetrods.com Ravon Streetrods is a small shop in Montana that hand builds 1932 and 1934 Ford cars. Most of our molds were taken off of original Ford cars found around Montana. We hand lay all our fiberglass, no chopper gun stuff. Wood reinforced door jambs, corematt stiffeners, steel dash brace for hangin the steering column. Quality and personal attention to each customer is important to us. We hope you enjoy your visit with us! All cars displayed on this website are products of Ravon Street Rods Inc. We take pride in our cars and accessories and hope we can fulfill your needs to make your dream become a reality, My name is Steve Poore, this is a family owned business, call if you have questions. THANK YOU for visiting and ENJOY! A word about the Ravon Streetrod, every car is a custom. While we do have, what I call a basic starting point for each model, your choice of dash, firewall type, hinges, chop, channel, fender package, hood type, it's all up to you. Big engine, small engine, over the top tyres and crazy chops. If you have never gotten this many choices, welcome. If you want a working cowl vent, roll down rear window, flip out windshield, heck, if you are gonna build a car from scratch, why not get it the way you want it. Lets talk about what you like, don't like, send me a picture of something you are in love with and let us build for you a solid foundation for your dream car. 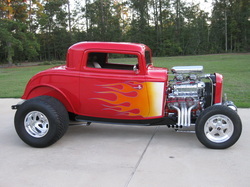 As a builder of 1932 and 1934 Ford replicas and kits, we want you to get exactly what you want. I can get anything you may want for the completion and can install almost all of it or you can get in a total kit form. I am a dealer for Speedway, Vintique, Vintage Air, Welders Series, EZ Wiring, and several others. If you want the A/C installed, we crimp the hoses to fit, if you want it wired, gauges installed or just want the parts in the trunk so you can install yourself. Some folks want me to install them, talk to me about it and we will figure out what works best for you. We use all new parts, no wrecking yard stuff and can get a project in your hands for whatever skill level your at.